i-MBA > Career: Is There an Algorithm for Success? Career: Is There an Algorithm for Success? 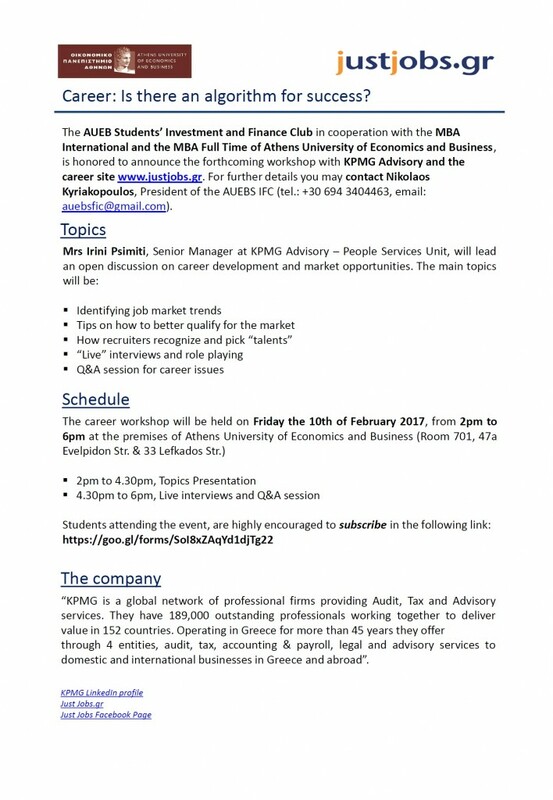 i-MBA collaborates with the AUEB Students’ Investment & Finance Club to organize a workshop with KPMG Advisory and the career site justjobs.gr on current market opportunities and a successful career development. The workshop will take place on Friday, 10th February 2017, 2pm-6pm at the building of Post-Graduate Studies of AUEB (47A Evelpidon Str. & 33 Lefkados Str. , 7th floor, room 701).